Farrier's Formula addresses the need for 'feeding the hoof,' recognising that a horse will only perform at its best when its hooves are effectively managed. The original hoof care supplement since 1979, Farrier's Formula is the recommended remedy of United States farriers for 12 consecutive years, utilising 30 years of equine research and experience in one effective product. Horses' hooves require a broad spectrum of nutrients to maintain optimal condition and Farrier's Formula is specially blended to supply all the essential nutrients that are key to hoof growth, repair and maintenance. Enriched with Biotin, Farrier's Formula promotes the internal and external health of hooves in the most depleted of conditions. Safe to be fed to horses with laminitis. One measuring cup (237 ml) will deliver 170 gm of product. *Farrier's Formula does not contain added sugar or molasses. The daily intake of starches, carbohydrates (WSC and NFC), and sugars from Farrier's Formula is very low, and is insignificant relative to the starch, sugar and carbohydrate intake in the total diet. **The iron content in Farrier's Formula is derived from the pellet conditioner (hydrated sodium calcium aluminosilicate, natural clay) in the form of iron oxide. The intestinal absorption of iron from iron oxide is minimal; therefore Farrier's Formula provides a minimal and insignificant amount of absorbable iron. If iron supplementation is desirable another form of iron such as iron proteinates, or other bio-available sources of iron should be utilized. 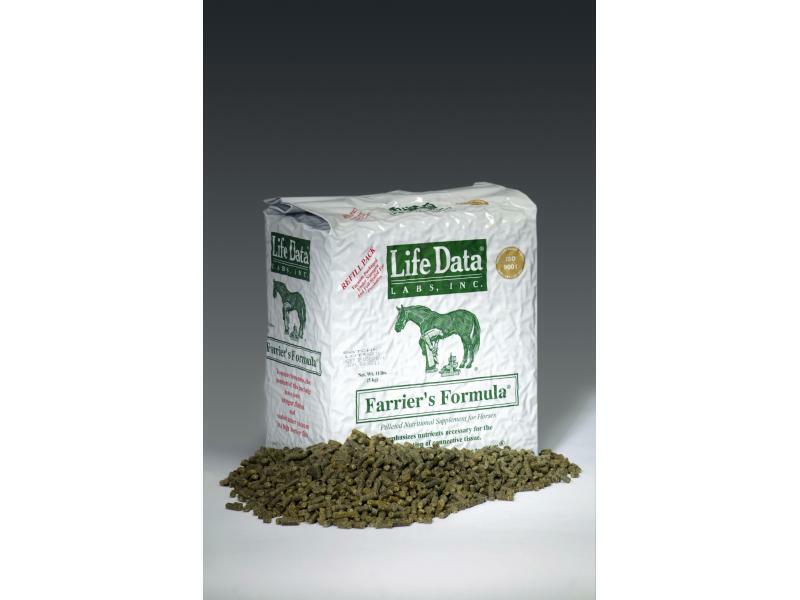 ***Farrier's Formula does not contain added potassium; however potassium is contained in minor concentrations with some of the ingredients such as alfalfa. Considering the small amount of product, the total level of potassium intake from Farrier's Formula relative to the intake in the total diet is not significant. Below are some recent questions we've received regarding Farrier's Formula for Horses, including answers from our team. My tb mare's feet have gone downhill since moving to a new livery, they are not growing and cracking. Her feed hasn't changed and lived out at moment. She has a chaff mix with a scoop of naf magic everyday and hay when she comes in about 4 times a week. Her weight is very good and was wondering if I can feed farrier formula with the naf magic. Thanks. 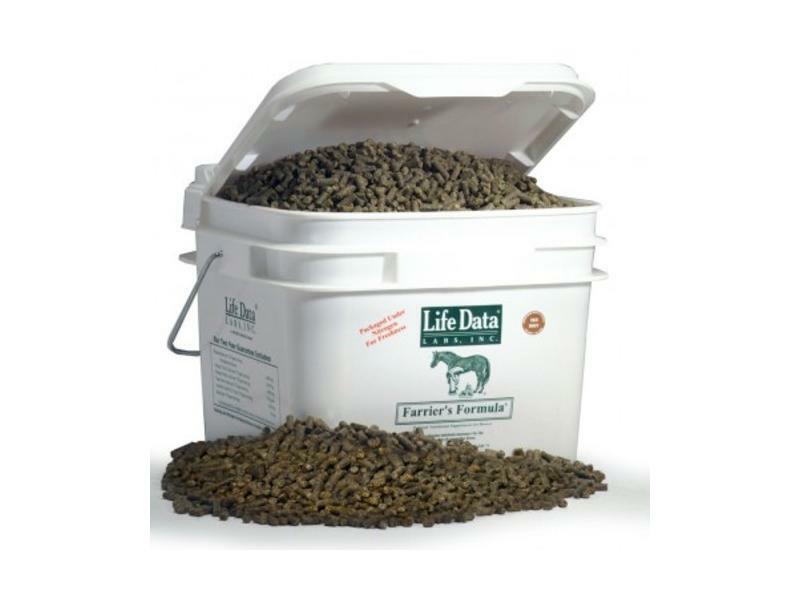 I would certainly give one of the food supplements for hoof health to your mare. This is a good one and is perfectly compatible with the Naff Magic. Make sure your farrier trims the hooves appropriately and don't leave it too long between visits. They should recover in time. It is perfectly safe to feed these supplements together. There is some overlap of ingredients which will do no harm and might provide additional benefit. Farrier's Formula for a fussy eater? I have a very fussy eater who is extremely reluctant to eat any type of additive. He has a general additive which i struggle to get him to eat. His feet are of a poor quality and I have had to have his shoes removed to try and let the hooves grow down enough to let the nail holes grow out. He is not good without shoes and is very footy at the moment. 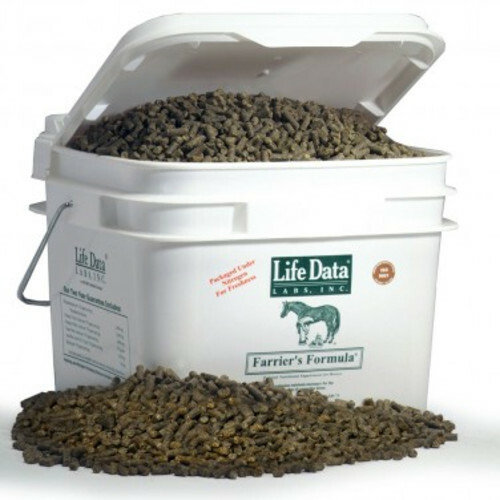 Do Life Data sell small sample sizes of Farrier's Formula. I am reluctant to buy the tub size if he won't even sniff it. He is currently on Profeet but although he has been on this for nearly a year, the quality of the hoof has not improved dramatically. I am happy to try anything as he is currently stable bound. Sorry but we cannot get samples of Farrier's Formula. I can only suggest getting some and trying it at a low level in his food at first, even just a trace amount will help slightly. You would probably find you could build the amount up gradually. Most of food choice is an acquired habit (for us too) and he will get to like it if he starts eating it. Best plan is to start off with such a small amount it will do no good, but it is introduced as a back-ground flavour which he very gradually gets used to. Over a few months you can get up to a proper level of supplementation. I am not aware of anything which would be better to try than Farrier's Formula.